Digital Signature Certificate, like hand written signature, establishes the identity of the sender filing the documents through internet which sender can not revoke or deny. A Digital Signature Certificate is not only a digital equivalent of a hand written signature it adds extra data electronically to any message or a document where it is used to make it more authentic and more secured. 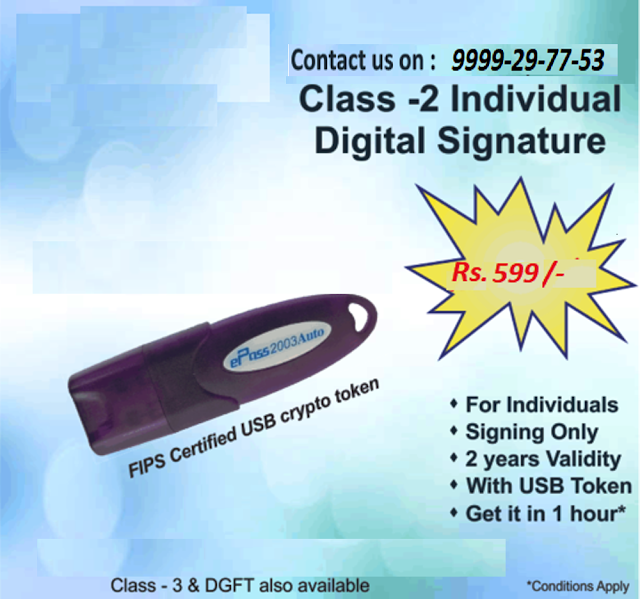 Digital Signature ensures that no tampering of data is done once the document has been digitally signed. A DSC is normally valid for 1 to 3 years after which renewal is required.These certificates are accepted for MCA 21, Income Tax E-filing, Gst, & E -tendering etc...There are basically 3 types of Digital Signature Certificates Class-1, Class-2 & Class-3 each having different level of security.All the authorized signatories of company under MCA, INCOME TAX & GST require Class-2 Digital Signature Certificate.Similarly any document filed by CA/CS/CWA & TAX PRACTIONERS under MCA require Class-2 Digital Signature Certificate.